A low-cost replacement to the Pedion Battlefields, PrintTiles use the innovative Pedion System, creating a 3'x3' (90cm x 90cm) Modular Outdoors Battlefield. Each tile includes one terrain feature –like roads, forests, hills, grass, broken earth etc- and can be printed plain or with grid. The PrintTiles board is suitable for RPGs like Dungeons & Dragons, Pathfinder, as well as wargames like D&D Attack Wing, and any other miniature medieval/fantasy/ww2 games. The tiles can also be combined with terrain pieces the players already have. The 16-tile base package includes: 5 road tiles (3 straight+2 turns), 4 plain grass tiles, 3 broken ground tiles, 2 forest tiles, 2 hill tiles. 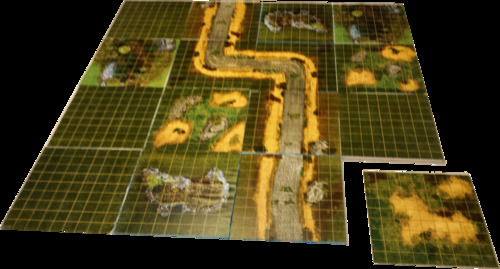 The players can combine the tiles in many different configurations, thus creating multiple fields for their battles. The Tiles are made from 1mm PVC Foam (500 gr/sq.m) overlaid with 600 dpi vinyl print and laminated for liquid and UV protection. Can be used with dry-erase and wet-erase markers. Each tile is 10”x10” (25 x 25 cm) and they connect with special velcro press-lok connectors with anti-slide bases. Extremely easy to transfer and store: when disassembled, the whole "board" needs only a 25x25x2 cm (1'x1'x0.78") square space, easily fitting into any cupboard or self.